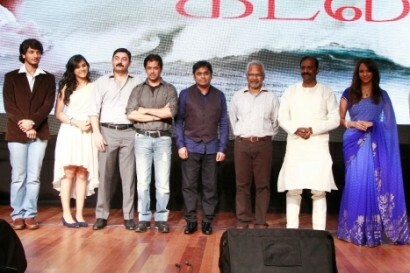 One of the year’s highly awaited films, Mani Ratnam’s Kadal, invited the press and media to Rani Seethai Hall in Chennai to formally launch and introduce the film’s lead actors, Gautham Karthik and Thulasi Nair. Suhasini Mani Ratnam, the better half of the director and key personnel of Madras Talkies, took to the stage to introduce Action King Arjun as the Master of Ceremonies for the event. Arjun was at his cool and suave best interacting with the various cast and crew members of Kadal. He would first go on to call Arvind Swamy a heartbreaker for having gone on a hiatus from films. Arvind acknowledged Arjun’s comments by saying that he wanted to spend time doing other things in life after doing Thalapathy at the age of 20 and the Alaipayuthey cameo at the age of 30. Arjun would next call upon Navarasa Nayagan Karthik, introducing him as a ‘gentleman of the Tamil film industry’, on stage and give him the opportunity to call on his son and present him before the regional media. Before Karthik could introduce his son, he spoke of his happiness that his son could score a chance such as this and believed it was not a mere coincidence that Gautham and Thulasi would be launched together much like he and Radha were introduced together in Bharathiraja’s Alaigal Oivadhillai. He believed that it was destiny if not a blessing from a higher power that it turned out in such a way. He was also confident that his son was in good hands and therefore he never visited the shooting spot even once. He thanked Arjun for taking care of Gautham in preparing his physique for the role and also keeping a close eye on him during the stunt sequences. It was then the moment for the spotlights to be focused on the two stars in the making, Gautham Karthik and Thulasi Nair. While the hero was introduced by his father, Thulasi was introduced by Mani Ratnam, as Radha was unable to attend the event. Both the newcomers sought the blessings of the audience and the press and said that they felt at home working with the team of Kadal. Mani Ratnam revealed that he saw the character Thomas in Gautham the moment he saw him and he then sparked the idea to approach Radha’s daughter to try and retrace Bharathiraja’s steps in Alaigal Oivadhillai. He said that when he first saw Thulasi, she was jumping up and down in her school uniform, but once she was in front of the camera she turned into her character, Beatrice, with total ease. When quizzed about her comfort levels being in front of the camera, Thulasi felt that acting was in her blood so she never felt nervous. The film’s lyricists, again a father-son duo, Vairamuthu and Madhan Karky spoke of their experiences working on the project. Vairamuthu revealed that the three songs he had contributed in the movie were all taken from his book ‘Thaneer Desam’ and therefore none of the songs were written for a tune, instead the approach was the contrary. He also spoke of Mani Ratnam’s mindset and how his core target audience is between the ages of 18-24 as it’s the most impressionable age for them to appreciate and enjoy art forms. Madhan Karky said that he took to songwriting after falling in love with songs from Roja and other Mani Ratnam’s movie songs. He said that he put in a lot of research into penning songs based on the fishermen’s lives. A.R. Rahman then appeared on stage, seated behind a grand piano, and commenced by playing his three most favorite songs he had composed for Mani Ratnam. The songs were ‘Chinna Chinna Aasai’ from Roja, ‘Oru Devan Thandha’ from Kannathil Muthamittal and the epic Bombay theme. Rahman displayed his closeness to Mani Ratnam as he was in a jovial mood, joking around about how he’s yet to complete the BGM for the movie. He said that Mani Ratnam had narrated the story to him, unlike his previous collaborations, so he had a good idea on how to approach the film. He said that he played ‘Adiye’ to Mani Ratnam as a surprise and Mani Ratnam admitted that he was stunned when he first heard the song. Rahman also declared that in Vairamuthu’s absence he picked up his ‘Thaneer Desam’ book and randomly opened up a page and chanced upon the words to the Kadal song ‘Moongil Thottam’. The event also had performances of ‘Moongil Thottam’ and ‘Adiye’ by its original singers. But in the end, the presentation was very much in character of Mani Ratnam; quiet, classy and crisply to the point. Life of Pi gets ten nominations! This page has information about A.R. Rahman's three favorite songs, kadal, Mani Ratnam.